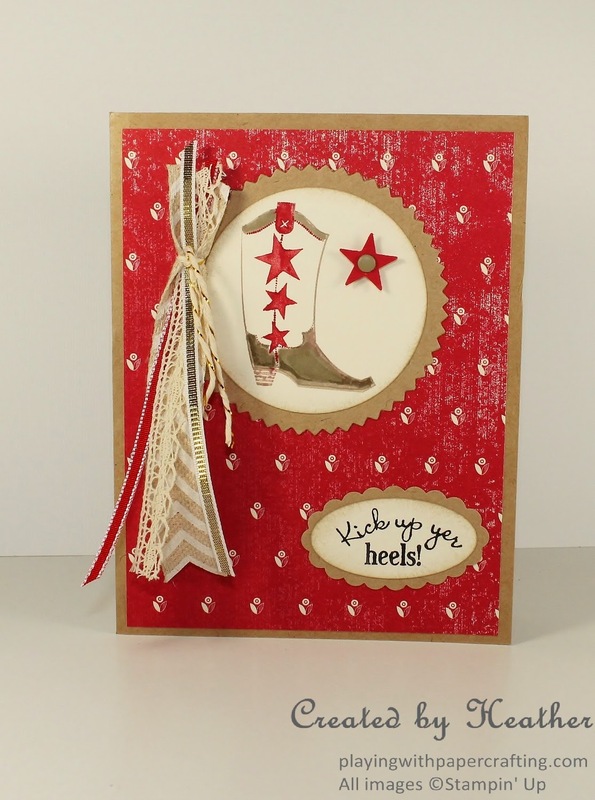 Playing with Papercrafting: Kick Up Yer Heels for Mojo Monday! 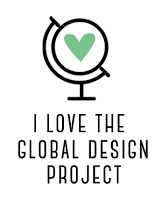 I was designing some cards for my Backyard Quick and Cute class, and I was wanting to showcase some of the Designer Series Paper Collections, because they are on sale until tomorrow - Buy 3 packages and get 1 package free. I wanted to use a collection that I had not yet tried and settled on the retro-looking Flashback series! To be honest, I wasn't really drawn to this collection at first, because - seriously? I lived through them and there are aspects to the seventies that I would rather forget, like Disco Music, for example! You can read all about my views on that decade here. 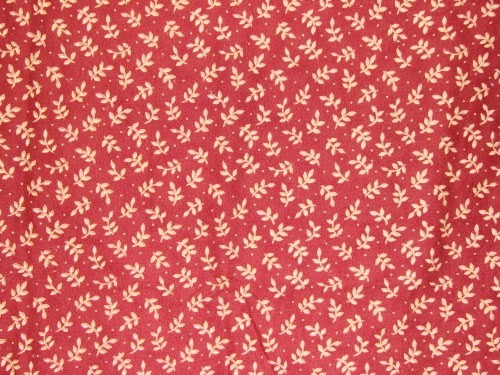 But as I leafed through the package, I came across this design and a bunch of ideas flooded into my head. I thought Western design, Bootiful Occasions, Kraft Paper.... and a swag of ribbons! 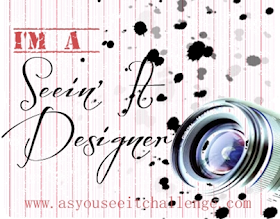 I worked on the layout, and when I was done, I thought that it just might work for MOJO Monday Challenge #356! I did choose not to go with the Tall & Skinny, though, because it doesn't work well for a quick and cute class as you would need to make an appropriately sized envelope, and also because, well, I had already made the card. So I am taking quite a bit of artistic licence with this one. I used the new Kraft Cardstock for the card base. It is heavier than our regular cardstock and is a natural Kraft colour. 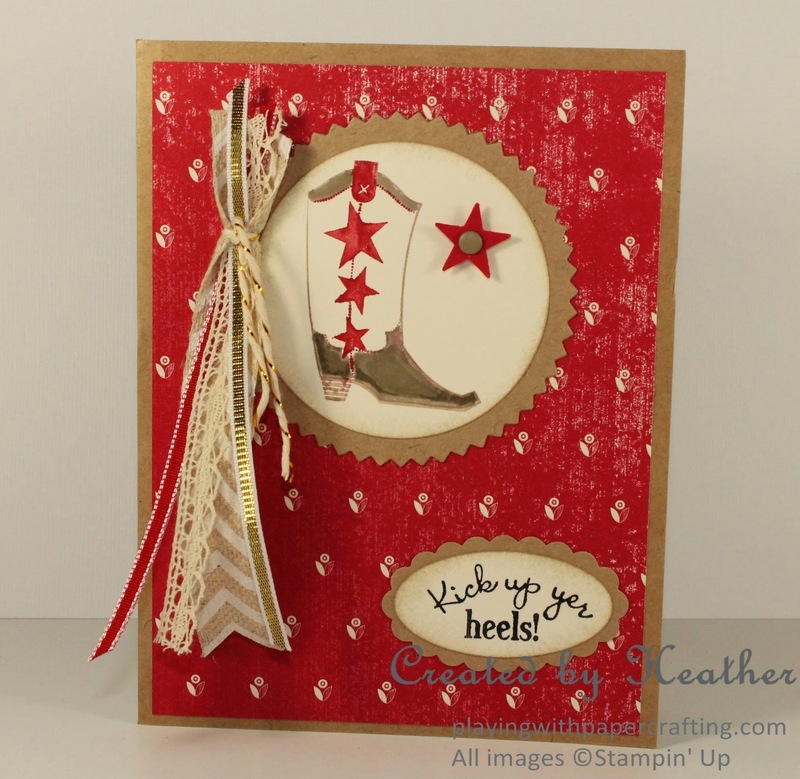 It adds just the right rustic touch to the card. 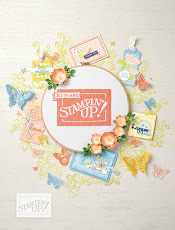 I finally got an opportunity to use the the Bootiful Occasions stamp set again. It's one of those sets that I keep getting out to use, but another set gets chosen instead. Do you have one of those? 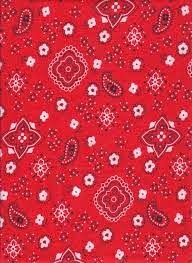 Well, this was the perfect occasion, because that DSP looks so western, like calico or bandana material. I stamped the boot in Crumb Cake and Real Red, but used Stampin' Write Markers so that I could leave out the sentiment and add it separately. After I stamped the image, I coloured in parts of the boot with the Crumb Cake Marker. I then die cut a circle containing the boot using the Circles Collection Framelit that just fits inside the Starburst Framelit I used for the matte. After cleaning the stamp thoroughly, I inked up the sentiment using a Basic Black Stampin' Write Marker and stamped it on some Very Vanilla cardstock. I punched it out using the Large Oval Punch and matted it with a Scallop Oval in the Kraft cardstock. This is what I like best about the card, though - that cute swag made of several lengths of different ribbons! I've see them on a few cards on blogs and Pinterest and then, on Sunday, my upline included one in the cards we were making on our Diva Rewards Day. 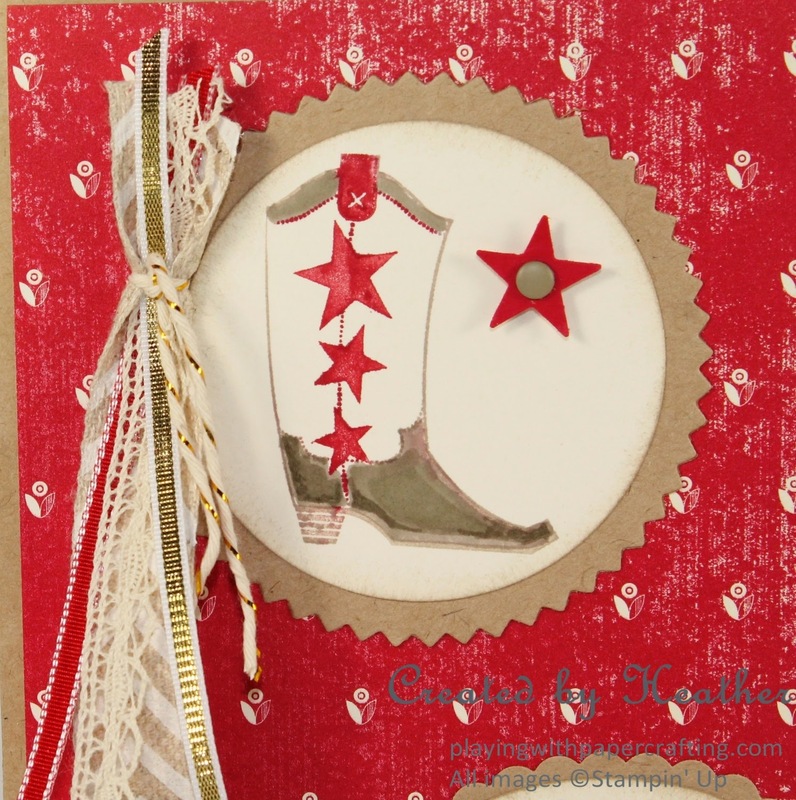 I fell in love right away and felt it would be a perfect embellishment for this card. All that is missing is a real feather or two! 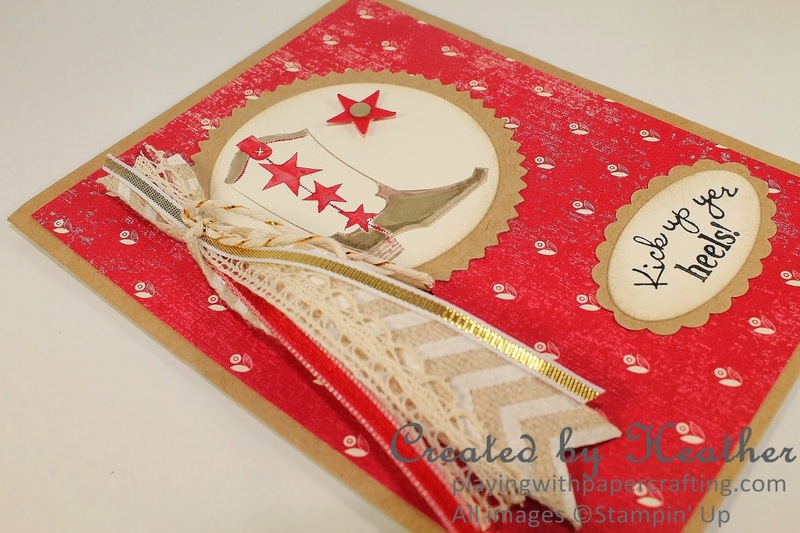 The finishing touch is a star punched from Real Red cardstock with the star from the Itty Bitty Accents Punch Pack, with a Crumb Cake Candy do on it! And that's all there is to it! Yee haw! I just wanted to remind you again that you have until tomorrow to take advantage of the Buy 3, Get 1 Free DSP sale! 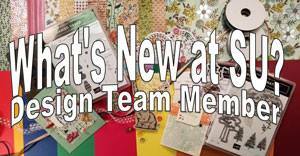 I am putting in an order tonight, so email me or give me a call if you want something. 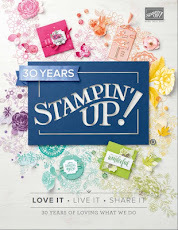 Also, starting August 1, ALL the Stampin' Blendabilities Assortments will be available to you as a customer!